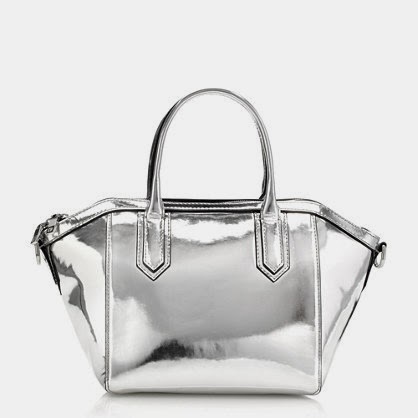 Maybe it's the Christmas season and all the talk of silver bells, but I just fell in love with this metallic satchel from J. Crew as soon as I saw it. It's such a gorgeous statement piece! I can't help but picture wearing it with an all winter white outfit and having it pop against a snowy backdrop. And I love how it's more mirror-like than most metallic pieces. J. Crew fully committed to making it shine! It's also a bag that you can tote around all year long. Metallics are perfect for transitioning from season to season with just a few simple styling changes, so you won't have to worry about putting it away for months at a time -- always a plus in my book! I have totally been eyeing that bag as well! LOVE! I'm obsessed with that bag! It's perfect for this season, but I can see it being a fantastic piece even in the spring. Totally a neutral, it would get a lot of wear!